I am always looking for something that might help my hair fall. I hate it when, after I shower, I have to pull out strands of fallen hair from my head. So when I was offered the opportunity to trial Activance, I of course said yes. I've been trialling this product for about 1 and a half months now, and I really like it. It's pretty simple to use; just spray on and massage into scalp. Oh, and did I mention? It smells amazing! 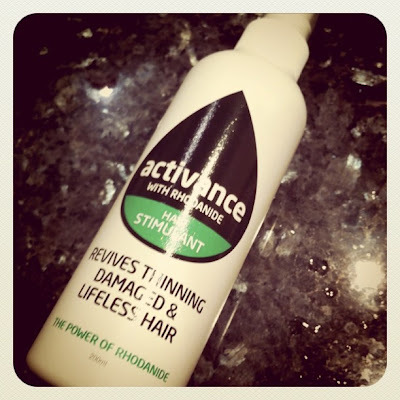 Activance is a hair cosmeceutical, containing Rhodanide, a nutrient found in egg yolks. According to research, this nutrient rejuvenates hair follicles and lengthens their growth cycle, thus improving the strength, shine and growth of each hair. This stuff didn't start working until about half a month after I started using it. After that, I started to notice a gradual decrease in hair loss. My hair also started looking healthier and shinier. Basically, the product checked all boxes for me. My scalp used to get really dry, and would flake as a result. A couple of weeks after using Activance, I've experienced much less flaking. Right now, I have frizz-free, bouncier hair. The lack of stress when I come out of the shower and comb through my hair doesn't hurt, either. Of course, this is no miracle product, and it doesn't stop hair loss fast in its tracks. My hair still falls out, I won't lie to you. But I can say that I comb out less fallen strands than I used to, and I'm still experiencing improvements each week. Would I repurchase? Yes! This retails at AUD 55 for a 200ml bottle. You can check out the Activance website to determine your closest retailer.